Audiolab M-DAC review | What Hi-Fi? We’ve been singing the Audiolab M-DAC’s praises for nearly five years, and it looks like we’re going to be singing some more. This multiple Award-winner is a terrific DAC and headphone amplifier. You’d think we’d stop being surprised, but the way in which the M-DAC unearths intricate details and cogently delivers each element of a song in such a fluid, dynamic way is still astonishing. The Dead Weather’s I Can’t Hear You has bamboozled many products with its slow-burning, brooding tone, but the M-DAC takes it all in its stride. The tension builds up through the tautly pulled strings, drums hit with impact and precision, and the rasping vocals have bite as well as subtlety. The DAC is transparent enough to clearly show the benefits of a well-recorded high-resolution album, but it doesn’t turn its nose up at MP3s or streamed songs either. Even a 320kbps Spotify stream of The Knack’s My Sharona has the sense of fun that the agile Audiolab brings to all music files. 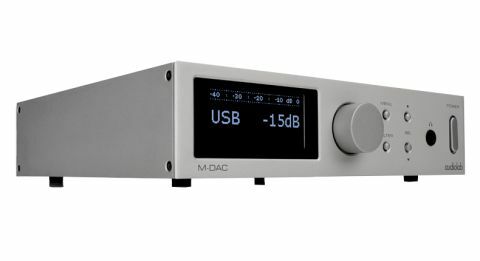 The M-DAC has got it all: punchy timing, seamless dynamics and plenty of space in a well-constructed stereo soundfield. It’s admirably precise, but it doesn’t show off about it – it’s having too much fun playing music. The M-DAC feels a lot more expensive than it is – the 2.7in OLED display is crisp, seamless in use, and the weighted resistance of the volume dial is nice. The box itself is well made, with a neat aluminium finish in black or silver. It’s a smart-looking DAC, one that wouldn’t look out of place with either your desktop or hi-fi system. It’s a joy to use, too. The buttons and wand-like remote are responsive, selecting inputs and switching between preset sonic filters are swiftly done, and you can see everything that’s happening with your music clearly on that large, informative screen. Along with bit depth and sampling rate, it even displays signal levels – it’s like the modern equivalent of traditional volume meters. A USB type B input is the main connection to your laptop, but be warned that file size is restricted to 24-bit/96kHz. If it’s high resolution 24-bit/192kHz you’re after, you’ll have to use the optical or coaxial connections, of which there are two inputs apiece. Single-ended and balanced XLR outputs can also be found on the back panel if you want to use the M-DAC as a preamplifier, and there’s a single 6.3mm jack on the front for your headphones. The M-DAC is loaded with seven filter options, and each of them has a subtle impact on the overall sound quality. Names such as Sharp Rolloff, Minimal Phase and Optimal Spectrum are easy to confuse, but experiment for yourself to find out which filter works best for you. The Audiolab M-DAC is a superb DAC in design and performance alike and, we think, offers far more than expected of its £600 price tag. We guarantee you’ll be immediately hooked by its effortlessly fluid and punchy sound. It’ll make you want to listen to all your songs anew – and you’ll be amazed at just how good your music can sound.